Who doesn’t love a nice thick stack of pancakes on a lazy Sunday morning? 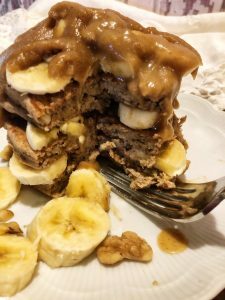 Pancakes are one food item I really missed after I started eating vegan – especially banana nut pancakes, my favorite. But the eggs…and the dairy…once they were off the table, I assumed that pancakes would be as well. It wasn’t until a friend, who was allergic to eggs, clued me in that you don’t really need eggs to make a pancake hold together. She was the one who first introduced me to the “flax egg”. 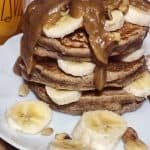 Just sub in some plant milk for the dairy milk, and you’ve got pancakes! 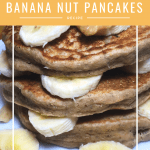 These Healthy Banana Nut Pancakes are oil-free and use a combination of whole wheat flour and oat flour. Add in the bananas and walnuts, top with my Coconut Date Syrup and you’ve got a healthy pancake breakfast! 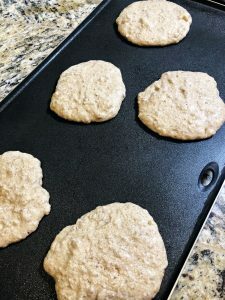 *Affiliate links* This post contains Amazon Affiliate links for items I found useful in making this recipe. 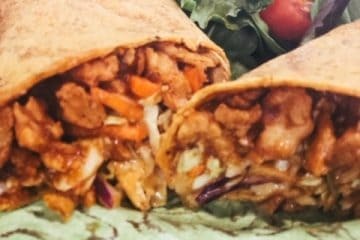 This means that if you click on and purchase through one of the links, Veggie Fun Kitchen might earn compensation at no additional cost to you. 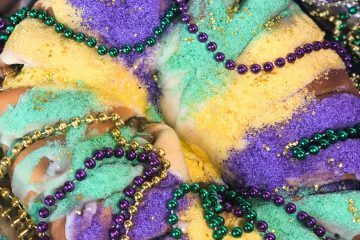 Start by mixing together the dry ingredients in a medium-sized mixing bowl. For this recipe, we use whole wheat flour and oat flour. To make oat flour, put 1 cup of Old Fashioned Oats in a blender and blend on high speed for a minute or two or until it has turned into flour. Eggs used in a baking recipe aid with structure and texture. 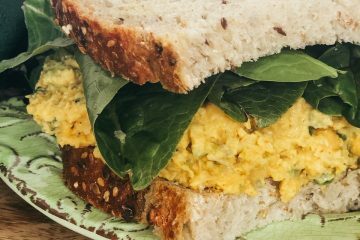 Vegan cooks have discovered the “flax egg” which is basically ground flax seeds mixed with water. 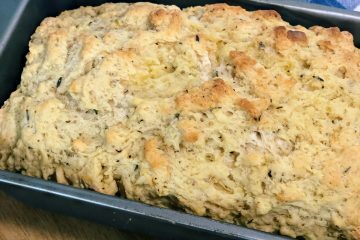 For this recipe, we just add in the ground flax seeds with the dry ingredients. It will mix with the wet ingredients at the end. 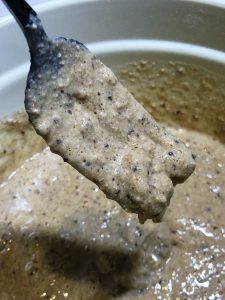 Using chia seeds is another way to give structure and help the batter to stick together. If you’ve never used chia seeds before, you need to know that soaking the seeds will bring out a gel-like film. This is why some people make chia pudding. 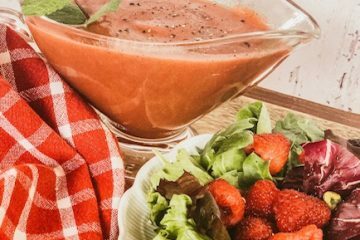 For our recipe, the gel on the chia seeds helps to bind the ingredients together. Wait! Did I forget the oil??? Did you notice a lack of oil in this recipe? That’s right, we don’t need oil to make a tender delicious pancake. The mashed banana subs in for the oil! 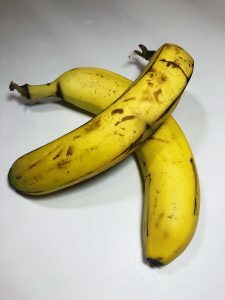 If you can, your bananas should be just on the other side of ripe. That means mostly yellow with some nice brown spots. 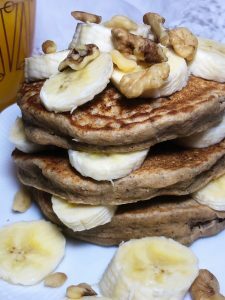 For me, I wouldn’t eat a banana this ripened; but they work great for these healthy banana nut pancakes. Choose bananas that are just slightly overripe. After I mash the bananas around a bit, I add in the unsweetened plant milk and mix well with my hand blender. If you don’t have a hand blender, a mixer will do fine. You just want the bananas fairly liquid – with very few lumps. 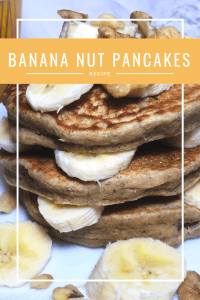 The lemon juice adds in a little sour flavor (like when you make buttermilk pancakes), but more importantly, preserves the color of the bananas. And of course, for the best flavor, don’t forget the pure vanilla extract! Make a well or indent in the middle of the dry ingredients. 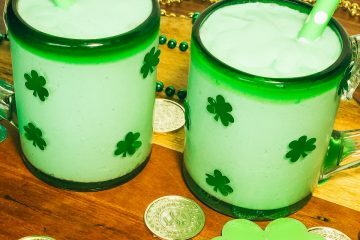 Pour in the wet ingredients all at once and stir by hand till mixed, but don’t over-stir. You only want to combine and mix the ingredients. If you “beat” or over-stir the batter, there is a chance your pancakes will be tough. Make a “well” in the dry ingredients and then add the wet ingredients. Your batter will be thicker than regular pancake batter but will still slide off the spoon (or fork in this case). The batter will be thick – not runny. Let batter sit for a few minutes while the griddle is heating. This will allow the flax and chia seeds to moisten. 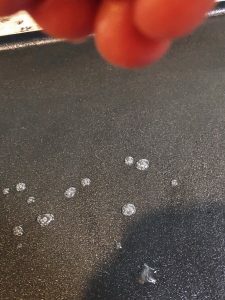 I set the temperature of my griddle to 325°. This is a little lower than you would heat for the traditional pancake. I find though that any higher than 325°, my pancakes will be undercooked on the inside and overcooked on the outside. I know the griddle is hot enough and ready to cook on when I can drip a little drop of water on the surface and it sizzles and dances. This is a trick my mama taught me! You will know your griddle is nice and hot when water dripped onto it starts to sizzle and dance. Before I drop my batter on to the pan, I do a little spritz with coconut oil and wipe off. My griddle is indeed a non-stick; but even with that, I like to make sure the surface is really slick so that turning the pancakes won’t be a problem. You can comfortably fit and turn five or six small pancakes at a time. You will know they are ready to turn when the edges have dried out slightly. Don’t wait for bubbles to appear on the edges as you might with a regular pancake. That just isn’t going to happen and you will have burned pancakes. This recipe makes about 15 small pancakes 12 medium-sized pancakes. 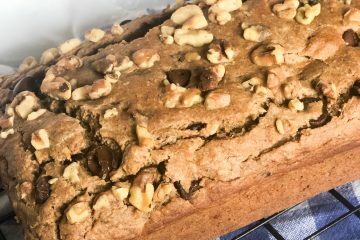 I add sliced bananas and walnuts of course! You have a choice when it comes to topping your pancakes – for a more traditional flavor, pour on the real maple syrup. 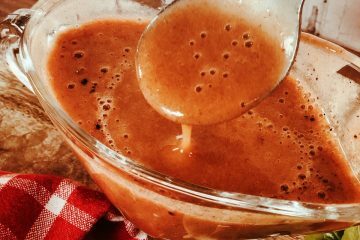 If you are looking for an option with less sugar (but yes, more fat), try my coconut date syrup! Or honestly, here is what I’ve been known to do: I combine them. Yum! 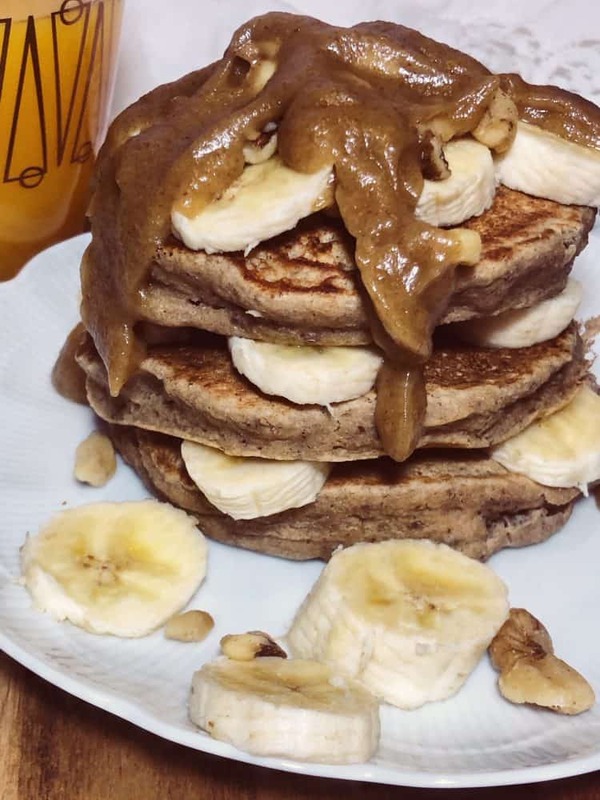 These Healthy Banana Nut Pancakes are oil-free, dairy-free and vegan. They are made with whole wheat flour and oat flour. 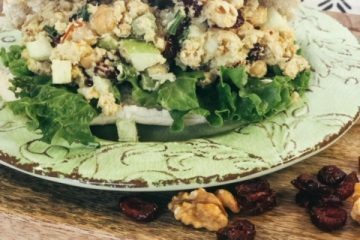 Other ingredients include ground flax seeds, chia seeds, mashed bananas, and walnuts. 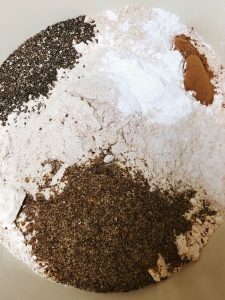 For the oat flour, place 1 cup Old Fashioned Oats in a blender and process at high speed for a few minutes until you have a flour-like consistency. Add all dry ingredients to a medium sized mixing bowl and combine well. Mash bananas into another mixing bowl. 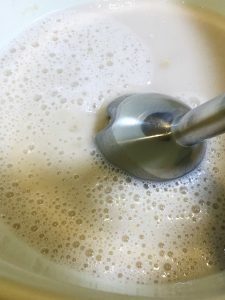 Add plant milk and with a hand blender or mixer, blend well or until smooth. 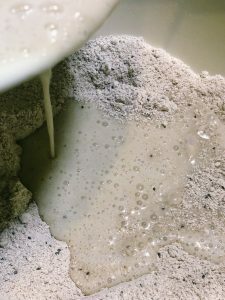 Make a well or indent in the middle of the dry ingredients. Pour the wet ingredients in all at once. Combine and mix by hand. Be careful not to over-mix or your pancakes will be less tender. Let sit for a few minutes while your griddle is heating. Lightly spritz a non-stick griddle with coconut oil and wipe away. Heat griddle to 325°. Once griddle is heated, using a small measuring cup, pour 5-6 small pancakes at a time on to the griddle. Turn after a few minutes when the edges look slightly dry. Continue cooking for a few more minutes or until both top and bottoms are just browned. Top with sliced bananas, chopped walnuts and your choice of syrup. 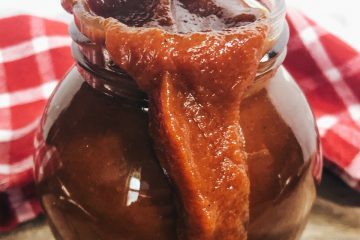 Try my Coconut Date Syrup for a truly plant-based option. If you use walnuts, make sure to inform anyone you serve these pancakes to.